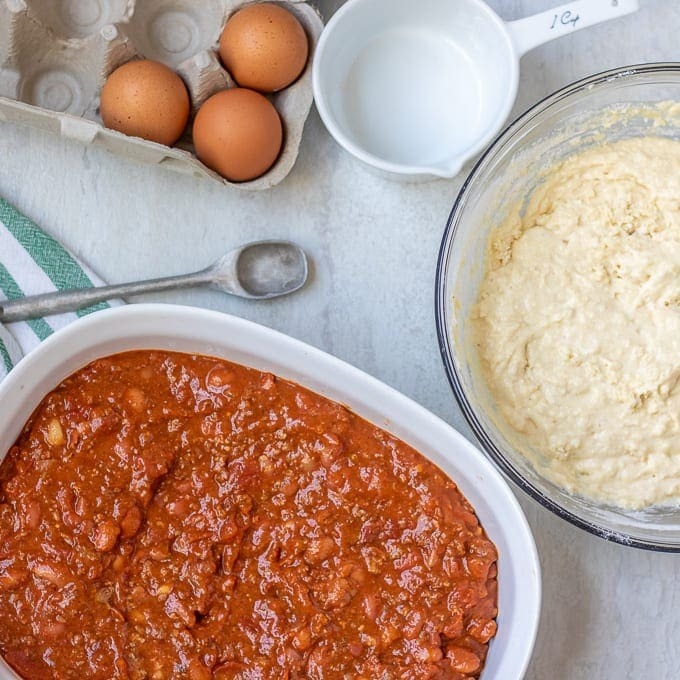 Tamale Pie is a hearty casserole made with chili seasoned meat and topped with a homemade cornbread that captures the delicious flavors of a tamales without all the work. This Mexican Tamale Casserole is sure to be a family favorite. But I do NOT have the patience or time to make tamales on a busy weeknight. But what I DO have time for is a tamale casserole. And while not tamales, this Tamale Casserole is a family favorite. 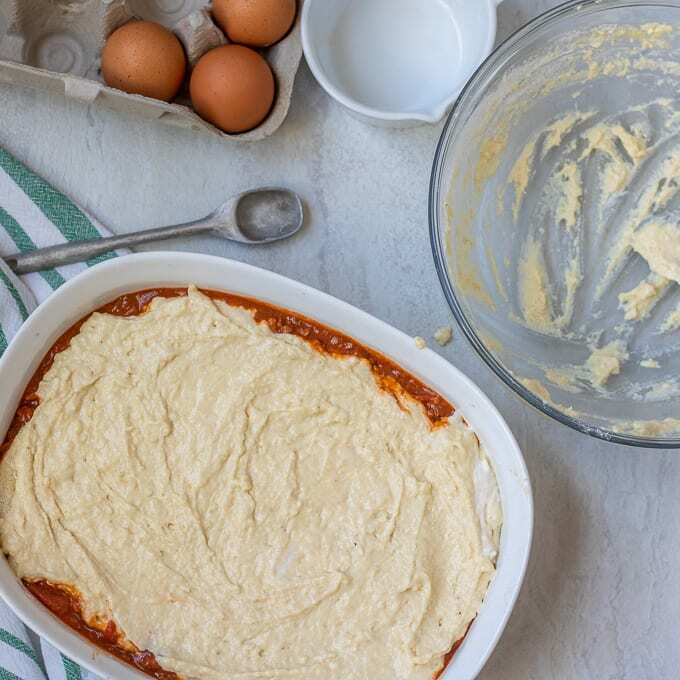 This recipe for Tamale Pie is incredibly versatile and most importantly unbelievably tasty. It is a everything you love about Tamales–creamy cornbread and rich, seasoned meat. Instead of steamed in corn husks, this Tamale Casserole is baked up in a casserole dish for a quick and family friendly recipe. You can make this tamale casserole with leftover chili, leftover shredded chicken, leftover pork, leftover taco meat, or even vegetarian chili. You can add beans, cheese, onions, peppers or additional spices, or you can keep it super simple and stick to just meat and seasoned tomato sauce. So let’s Break this Tamale Casserole Down. Once oil is heated,add in onion and saute until onion is softened, about 3-5 minutes. Season with chili seasoning, garlic, and tomato puree. Stir in beans if desired. Spread Tamale Base in 2 quart casserole dish. At this point, you can top your meat mixture with cheese if desired. I prefer using a homemade cornbread topping for this Tamale Pie, however, feel free to use a boxed cornbread. Sift together flour, corn meal, baking soda, and salt. In a separate bowl, mix together milk, yogurt, honey and eggs together. Dollop cornbread mixture over meat mixture. Gently spread with a spatula over meat mixture. Bake until cornbread is set. Serve with cilantro and a squeeze of fresh lime juice. Use leftover Chili or Leftover Chicken Chili for the base of your tamale casserole. Top with cornbread mixture and bake as directed. Use leftover rotisserie chicken or shredded chicken for the meat in this tamale casserole. Once oil is heated, add in diced onion and 1 pound ground beef. Use leftover pork carnitas for the base of your tamale casserole. Use leftover lentil chili for the base of your tamale casserole. A hearty, thick chili is topped with homemade cornbread for an easy, Mexican casserole that is reminiscent of tamales. Add in onion and saute for 3-5 minutes, or until onion is softened. Add leftover meat to skillet, along with beans, seasonings, garlic, and tomato puree. Saute until mixture is warmed through, about 5-7 minutes. Spread out meat mixture in 2 quart casserole. Mix together the dry ingredients for the cornbread. Add the milk, eggs, and yogurt to the flour and mix until just combined. Dollop the cornbread batter over the top of the casserole and spread to cover. Bake uncovered for 45 minutes until bread is golden brown. Looks delicious and right up our alley. My Hubs would love this! Pinned to my Good Eats board. I hope you will share with us at Merry Monday! Awesome! Thanks for pinning and I will visit the party! Love finding quick and easier ways to enjoy some of my favorite food. Perfect for a weeknight dinner. I could eat this for Sunday brunch. Just pass the hot sauce! Great Idea! My son loads up on hot sauce too! Looks like a great dish to make on a cold evening! Yes, this will warm you up for sure! Quick and easy recipes like this are perfect for weeknight dinners! Whole White Wheat Flour? Can I just use regular flour? I really want to make this but I didn’t know if this was a special flour. Of course you can use regular flour! It will work perfectly. I use the whole white wheat to get a few more nutrients in 🙂 Enjoy and let me know how you like it! I love Mexican too. Let me know how you like it! This looks delicious! I pinned to my Mexican or Cinco De Mayo Board. Thanks Linda! This would be a great dish for Cinco! HA! My mom used to make a dish with corn tortillas as well, but I have to say I enjoy the cornbread much more. But I am a lover of carbs!! I love tamales, but I never wanted to put forth the effort to make them. This pie idea is so perfect! Kiano, I am with you on the effort thing! It is a lot of work. The pie is a great alternative! Enjoy! Oh my goodness! This looks so delicious! I am adding this to my list of meals to try. This yumminess is now on my must try list. 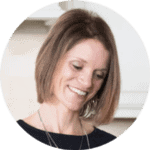 I invite you to share at my blog hop( you can link up through Sat) Hugs! I hope you enjoy it and thanks for sharing he invite to the party. 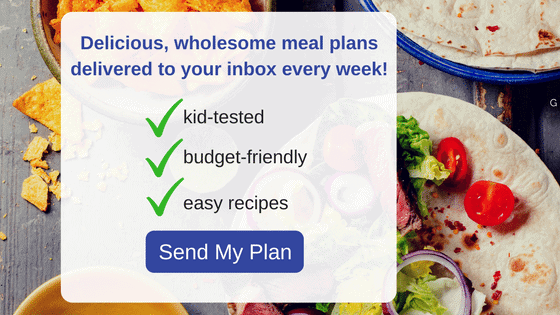 Margy–your son will be able to find the meat in this dish for sure! And yet, it still stretches your dollar by using one large cut of meat into a few meals. Enjoy! You bet. I really hope your family enjoys! Oh yum, I love tamales, this sounds incredible! Joy, if you love Tamales, you will love this easy version! 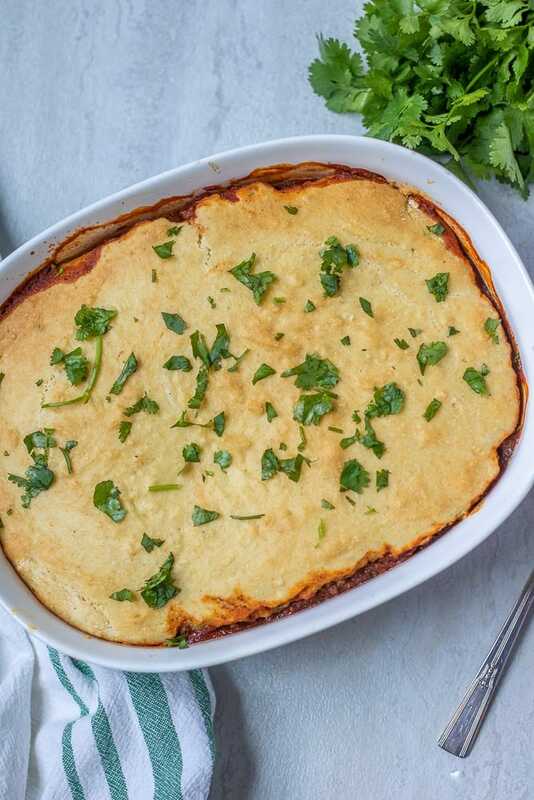 I am a huge sucker for tamale pie. Anything tamale. Seriously. They are AMAZING! And this looks AMAZING! I can’t wait to try it! Thanks Christie! 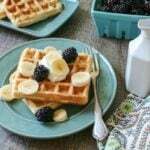 You will love this recipe for sure! Mmmm…. 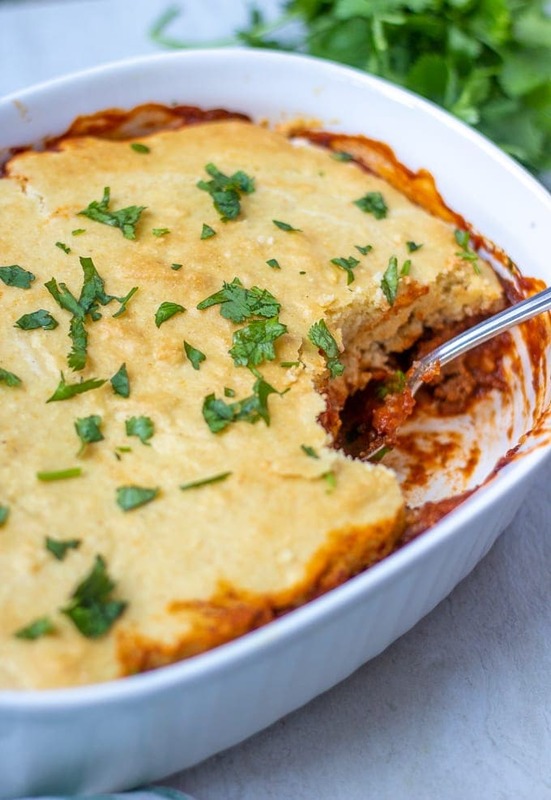 love tamale pie! I’ve never used yogurt in the cornbread part… looking forward to trying. Pinning. I love hearing that Abigail. I hope your family enjoys! OMG this looks so good and reminds me of growing up. We used to eat this all the time! Thanks Amber. Nothing like a dish that reminds you of childhood. Traditional tamales are fabulous, but this is much easier way to enjoy them for sure! Yummm this sounds delicious. I love anything Mexican flavored, and especially pork carnitas so I’m sure this is fantastic! If you love Mexican Judy, you are sure to love this dish! I love tamale pie! This looks like a simple recipe for a delicious meal! Super simple and a great way to enjoy tamales! I would really love to make this tonight but all I have is cornbread mix. Is there a way I could sub this instead and maybe add a little honey and sour cream since I don’t have yogurt either. Absolutely! Cornbread mix will work perfectly, as will sour cream and honey! But you can follow the directions for the cornbread mix and top your casserole with that as well. Enjoy! I love the vegetarian version myself! Enjoy Suzy! What a fantastic recipe! I love tamales but like you mentioned, do not have the patience or time to make them. This recipe totally satisfies that tamale craving – so easy to make and delicious too! Thanks Joanie! I love making EASIER versions of classic recipes–so perfect for busy nights.